These are the people who have donated their hard earned cash (or won special official contests) and time to help keep Elfpack running, and make it a better place. These generous souls are recognizable by the shimmering gold bars of their cells, and the brilliant halos above their head. Why donate? Because you love us, of course! 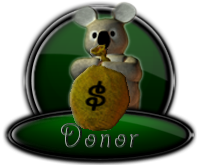 Also, you get additional features, such as color rights in your house or having your image limit removed, depending on how much you donate. Check it out!